One of the most common things we hear in the computer repair shop that I work part-time in is that the computer has crashed, and could we please make sure to get the data off of the hard drive before we re-install windows. And, the first question we always ask is, “do you have your data backed up?” I probably don’t have to tell you what the common answer is to that question. Many computer users assume that backing up their data is expensive. We see advertisements for services that cost $40-$50 a month, and for external hard drive solutions that are several hundred dollars. But, keeping your data safe, doesn’t have to be expensive. In fact, I’ve got all my important data backed up, and I spend less than $50 a year. It’s not because I have some inside information, or get favors from tech companies. You can do it too. And, if you value your data at all, you should. This is the set-up I currently use. 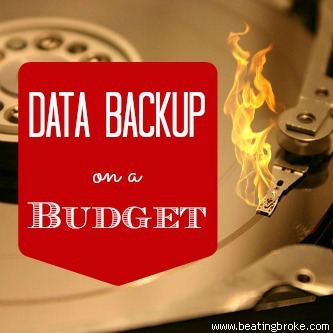 There are several other options that you could use for data backup. The aforementioned external hard drives can be super easy to use. One drawback to using one, however, is that the data is still physically located in the same place as the PC you’re backing up. That’s fine if you only need to restore because of PC failure, but can be a disaster if you have to restore due to something like a fire or flood. Ideally, external hard drives that are used for PC backup should be placed in an off-site location, but since that’s a bit cumbersome and likely to keep you from actually backing up your data, they should be at least placed in a fire-proof safe when not in use. Another, more ideal way to back your data up, is through a service like Dropbox. There are a few others that are specifically designed and marketed as data backup services. Carbonite is probably the most well-known of them, but there is also CrashPlan, and Mozy that do the same job. Carbonite and CrashPlan come in at $59 a year (about $4 a month), while Mozy comes in at $5.99 a month. Crashplan has a free plan, but it requires you to have your own server to back up to. This can work out if you have a second computer at another location or have a friend that you trust with your data. They’ve also got a plan that’s $33 a year, but it limits you to 10GB total storage. Not backing up your data can be an expensive mistake to make. Not only can it cost you a lot of money ($100 or more) to get your computer fixed, but you could lose all of your valuable data. Save yourself the money of having it recovered, and save yourself from losing years of photos and information; get a data backup plan. One of the nice things about a disaster recovery backup plan is that you usually don’t have to use it. More often than not, our computers run on and on until we replace them and we transfer the data to the next machine. Earlier this week, I had to put my set up to the test. My main storage hard drive crashed. While I tried to recover the data from it, it was lost. With a newly formatted hard drive, I was able to reinstall Dropbox and as soon as it was done syncing, I had all the data that was in Dropbox back on my PC. The Flickr photo backup was a little bit more cumbersome. There are several apps out there that you can run that will allow you to download all of your pictures one after the other. I ended up using one called Flump. It worked, but the pictures are in one heck of a mess. None of them have any names, and the structure I had before is lost. So, I’ve got 7000+ pictures to sort through. Moving forward, I’ll be adding one of the above back up services (Crashplan or Carbonite) to my PC to back up my file structure and other assorted things. For the $59 a year it costs, it’s worth the added convenience of not having to deal with the sorting of files and individual applications. Do you backup your data? What do you use for your data backup plan?